The lens of the eye is a biconvex, relatively acellular, optically transparent intraocular structure that with the cornea serves to transmit light to the retina with minimal light scattering (Fig. 1a). Early anatomists viewed the lens as the location of meaningful visualization. We now know that this is the function of the retina, with the lens serving as a conduit of light transmission and focus to the retina. The lens can change shape with the aid of the ciliary muscles, thereby changing the focal distance to the retina and bringing the image into sharp focus on the retina. This adjustment of the lens is known as accommodation (similar to the focusing of a photographic camera via movement of its lenses). The lens is more flat on its anterior side than on its posterior side. (Fig. 1b). Figure 1a. 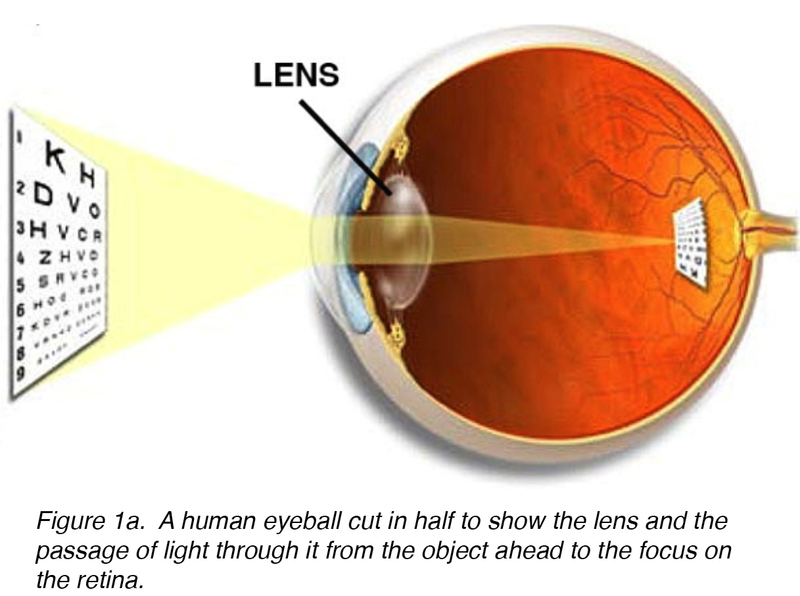 A human eyeball cut in half to show the lens and the passage of light through it from the object ahead to the focus on the retina. Figure 1b. Histological section of normal crystalline lens (H&E stain, X2). The sectioned iris is shown (iris) but the ciliary body is mostly out of the plane of the section. Notice the lens is flatter anteriorally, facing the cornea (cornea). The mature lens originates from surface ectoderm and develops through a highly organized process correlated with the neuroectoderm germ cell layer. Early in embryogenesis the diencephalon, neuroectoderm derived tissue, forms two outpouchings called the optic vesicles. The optic vesicles induce formation of the immature lenticular cells when it comes in contact with surface ectoderm. The immature lenticular cells thicken to form the lens placode. Concurrently, the optic vesicles invaginate causing an indentation on the lens placode called the lens pit (Fig. 2a). Figure 2a. 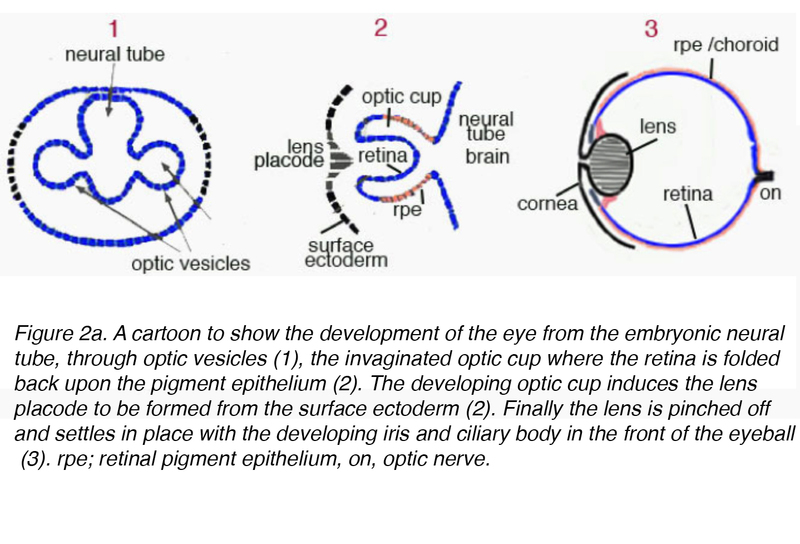 A cartoon to show the development of the eye from the embryonic neural tube, through optic vesicles (1), the invaginated optic cup where the retina is folded back upon the pigment epithelium (2). The developing optic cup induces the lens placode to be formed from the surface ectoderm (2). Finally the lens is pinched off and settles in place with the developing iris and ciliary body in the front of the eyeball (3). rpe; retinal pigment epithelium, on, optic nerve. Figure 2b. Embryonic lens. Lens vesicle posterior epithelial cells (pec) elongate to form the primary lens fibers (H&E stain, X10). 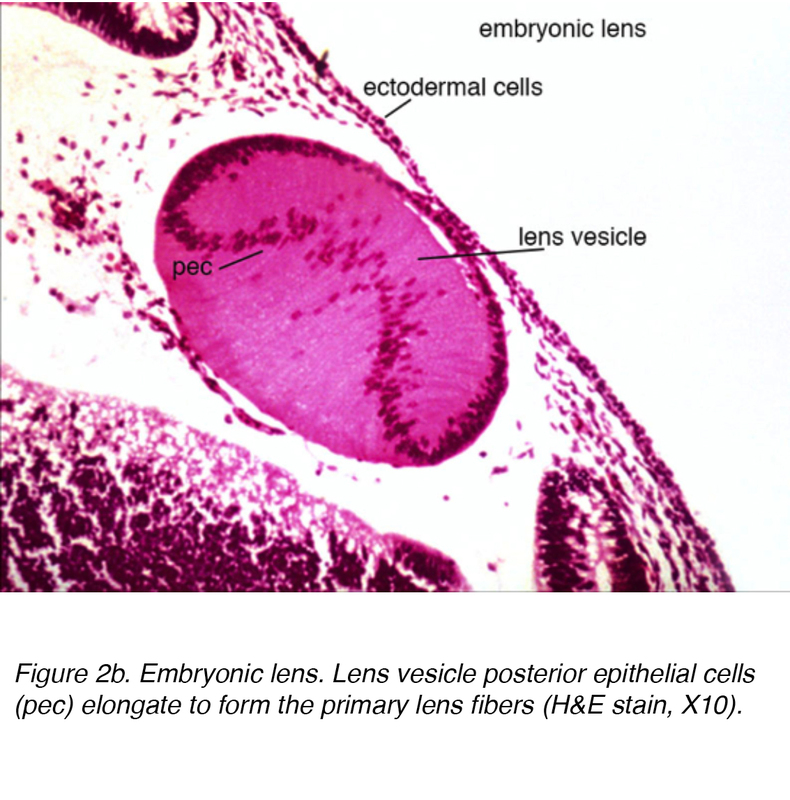 The anterior cells become the lens epithelial cells, while the primary lens fibers collectively form the embryonic nucleus. Subsequently, secondary lens fibers begin to elongate from the lens epithelial cells to form the fetal nucleus during the gestation period and continues to grow multiple layers. As the secondary lens fibers elongate from the equator, they form Y-shaped sutures by meeting anteriorly and posteriorly during fetal growth. The secondary lens fibers eventually grow to form the adult nucleus with new layers of lens fibers forming the lenticular cortex. 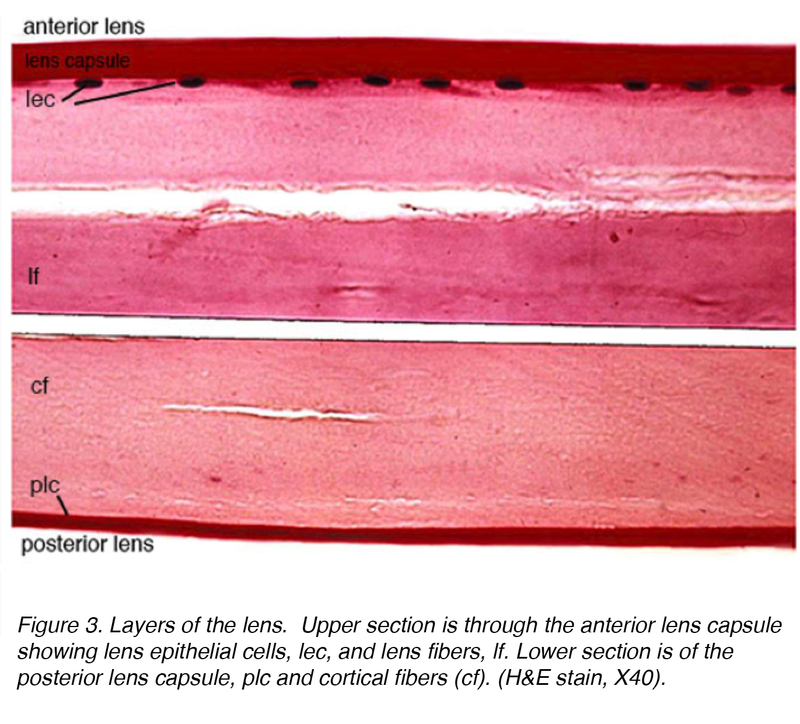 During lenticular development, the hyaloid artery delivers nutrition and growth factors through the tunica vasculosa lentis, a vascular structure that envelopes the lens nucleus. However, this structure undergoes involution prior to birth to resemble the avascular lens seen in the adult. 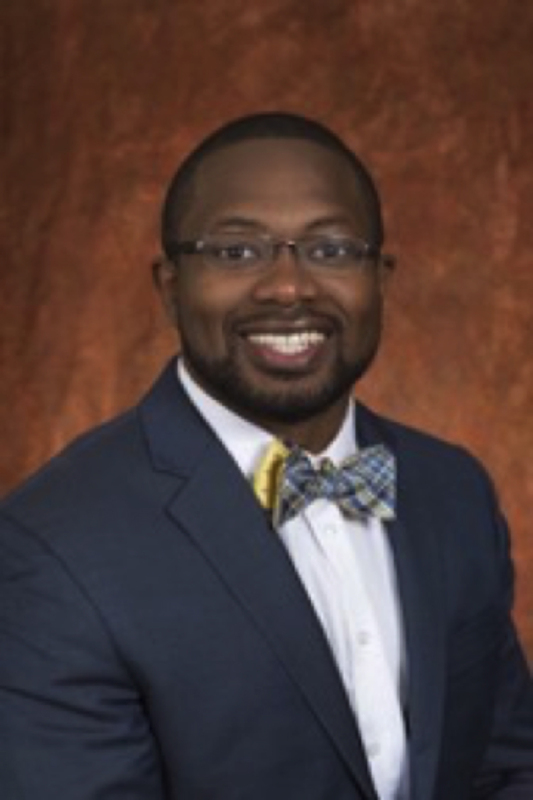 A firm understanding of the embryology and development of the lens will provide great insight into the pathology associated with cataract formation. 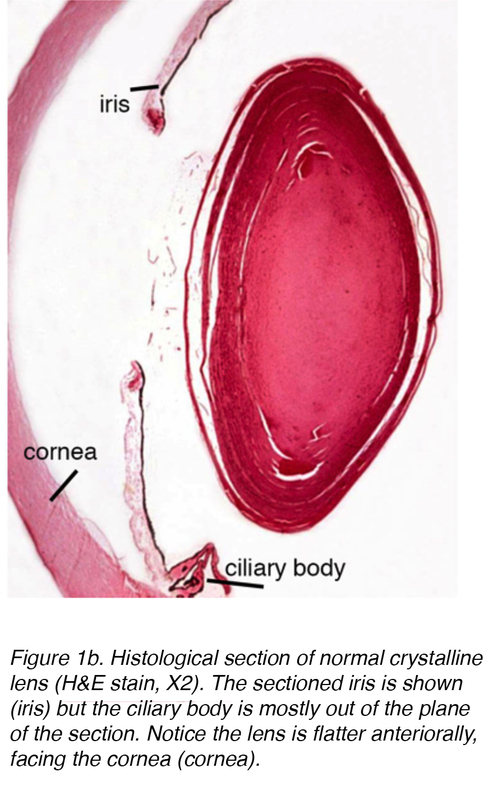 Figure 3 shows a stained section of the adult human lens with anterior part of the lens in the top section and the posterior part in the lower section. Figure 3. Layers of the lens. Upper section is through the anterior lens capsule showing lens epithelial cells, lec, and lens fibers, lf. Lower section is of the posterior lens capsule, plc and cortical fibers (cf). (H&E stain, X40). The lens is composed of 4 structures: capsule, epithelium, cortex and nucleus (Fig. 3). The capsule is the basement membrane with type VI collagen elaborated by the epithelium layer, and stains positively with periodic acid shiff (PAS) stain. It is optically clear and acellular. 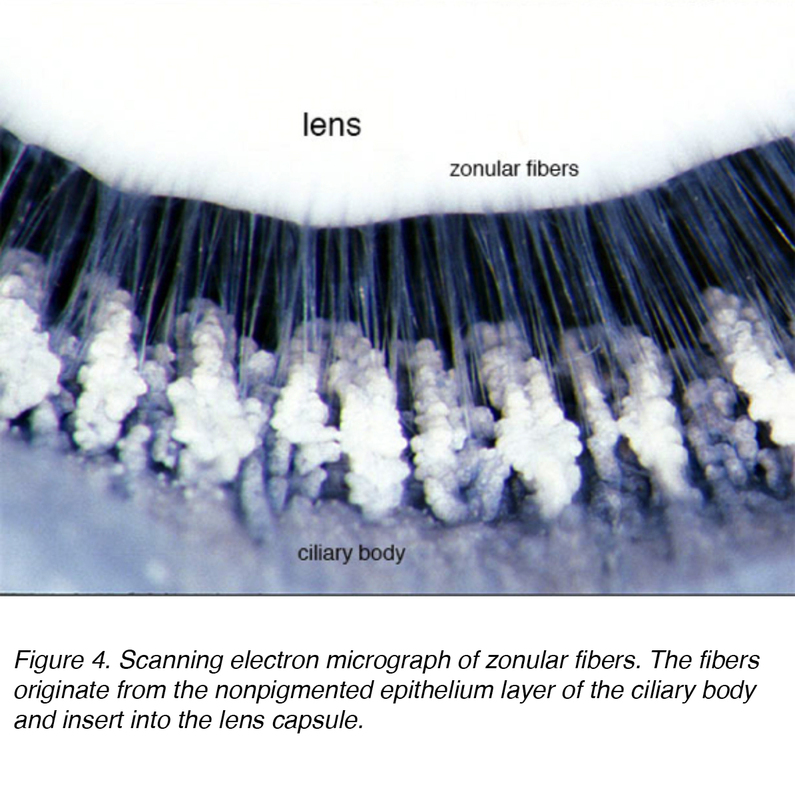 The lens is held in place by zonular fibers, otherwise known as the zonules of Zinn (Fig. 4). These elastic fibers originate from the nonpigmented epithelium layer of the ciliary body and articulate with the outer layer of the capsule, the capsular lamellar layer. There is a reduction of zonular tension with contraction of the ciliary muscle leading to a more spherical shape allowing focus on more proximal objects. This process is called accommodation. Figure 4. Scanning electron micrograph of zonular fibers. The fibers originate from the nonpigmented epithelium layer of the ciliary body and insert into the lens capsule. The lens epithelium has mitotically active cells that undergo further differentiation via an elongation process, increase in intracellular protein and loss of organelles. These cells are arranged in one layer across the posterior aspect of the anterior capsule. 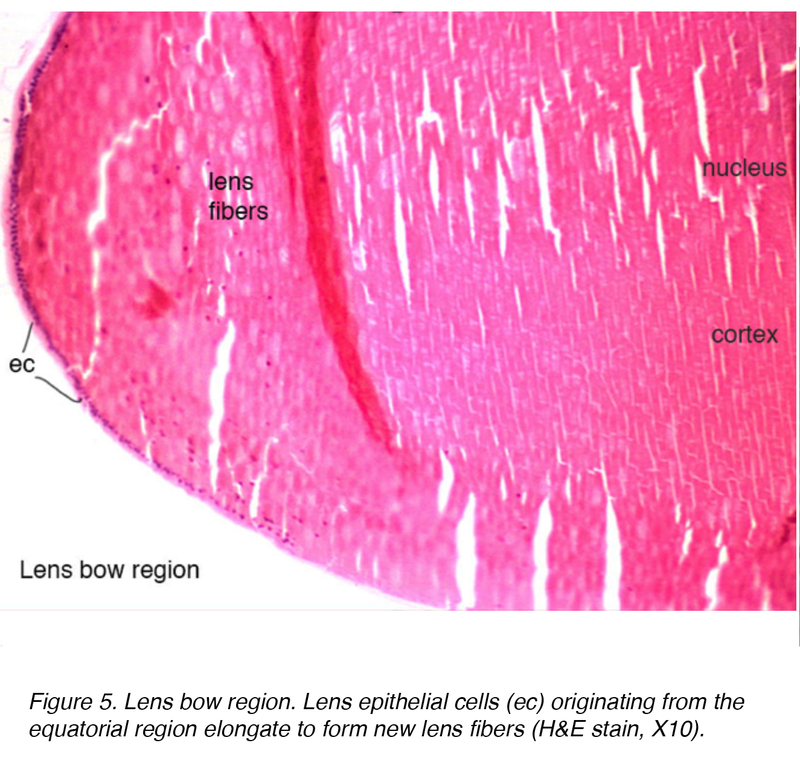 The equatorial bow region of the lens is where lens epithelial cells elongate to form lens fiber cells (Fig.5). Terminal differentiation of the epithelium eventually leads to the fiber layers of both the cortex and nucleus, with older fibers being located more centrally. Figure 5. Lens bow region. Lens epithelial cells (ec) originating from the equatorial region elongate to form new lens fibers (H&E stain, X10). While the nucleus is denser, histologically, there is no distinction between the cortex and nucleus (Fig. 5). The only appreciable difference is age, with older layers located more centrally. Interestingly, as the cortex and nucleus layers grow, the overall diopter strength of the lens increases owing to the increased diameter and curvature of the lens. The lack of organelles within the nucleus and cortex serves to provide an optically clear media for light transmission. The adult lens is almost three times the mass of its corresponding neonatal version, 90 mg to 250 mg. In the adult, the lens lacks vascularity or innervation thus the metabolic demands of the lens is met by a constant flow of aqueous humor that serves as a conduit for both removal of waste and the delivery of nutrients. Figure 6. 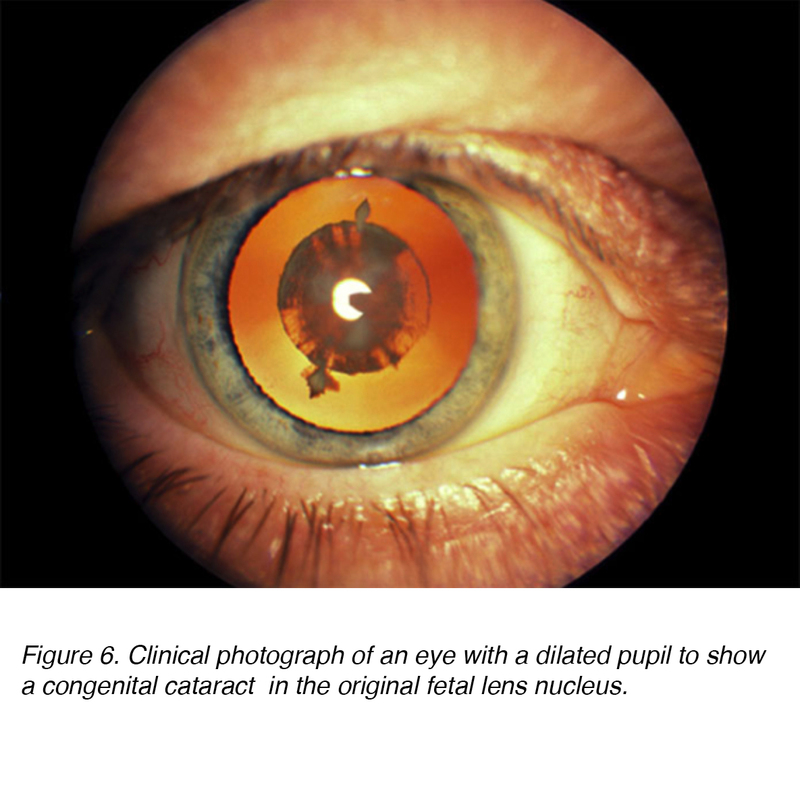 Clinical photograph of an eye with a dilated pupil to show a congenital cataract in the original fetal lens nucleus. Congenital cataracts are lenticular opacities that cause significant light scattering at birth or noted shortly after (Fig. 6). An estimated 200,000 children worldwide are blind as a result of congenital cataracts, with an incidence of 40,000 in developing countries. [1,2] In regards to laterality, the prevalence appears to be the same for unilateral vs. bilateral. Surgical intervention for both unilateral and bilateral cataract is paramount to prevent long term deprivation amblyopia or visual loss. [3-4] Amblyopia is defined as a dysfunction in visual processing, characterized by poor visual acuity in one or both eyes and abnormal binocular depth perception. While both are critical to detect, the long term severity of bilateral visual deprivation appears to be less than its unilateral counterpart. . The major morphological types of congenital cataracts are categorized as zonular, polar, total and membranous. Congenital zonular cataracts are described as an opacity that is localized in a specific lenticular region. A distinct subtype can occur depending on the time of the injury or developmental error. If the insult occurs during the first 2 months of gestation, then an embryonal nuclear cataract can occur. Injury occurring in the third month of gestation can form a fetal nuclear cataract, characterized by opacities located between the anterior and posterior Y-sutures, and is known as a sutural cataract. A teratologic etiology can explain arborization of a sutural opacity. Polar cataracts are distinct opacities found within the subcapsular cortex in the polar regions, with anterior and posterior subtypes. A Mittendorf dot results when the hyaloid vessel fails to involute. It is characterized as a small, dense white spot on the posterior surface of the lens capsule. The etiology of cataracts during infancy is broad including intrauterine infection, drug-induced, metabolic disorders, trauma, ocular diseases, inherited syndrome and idiopathic. A common cause of visual impairment in older adults is age-related cataract, which is subcategorized as nuclear, cortical or subcapsular in type. Cumulative incidence of nuclear, cortical and posterior cortical are 29.7%, 22.9% and 8.4% respectively. [7,8] Nuclear cataract is the most common age-related problem (Figs. 7 and 8). Figure 7. 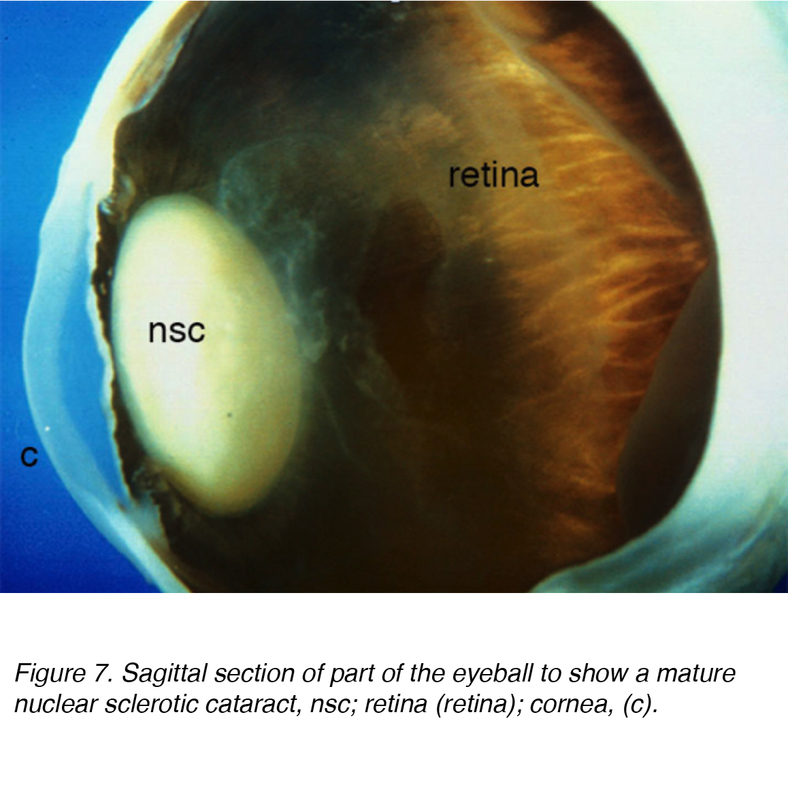 Sagittal section of part of the eyeball to show a mature nuclear sclerotic cataract, nsc; retina (retina); cornea, (c). Figure 8. 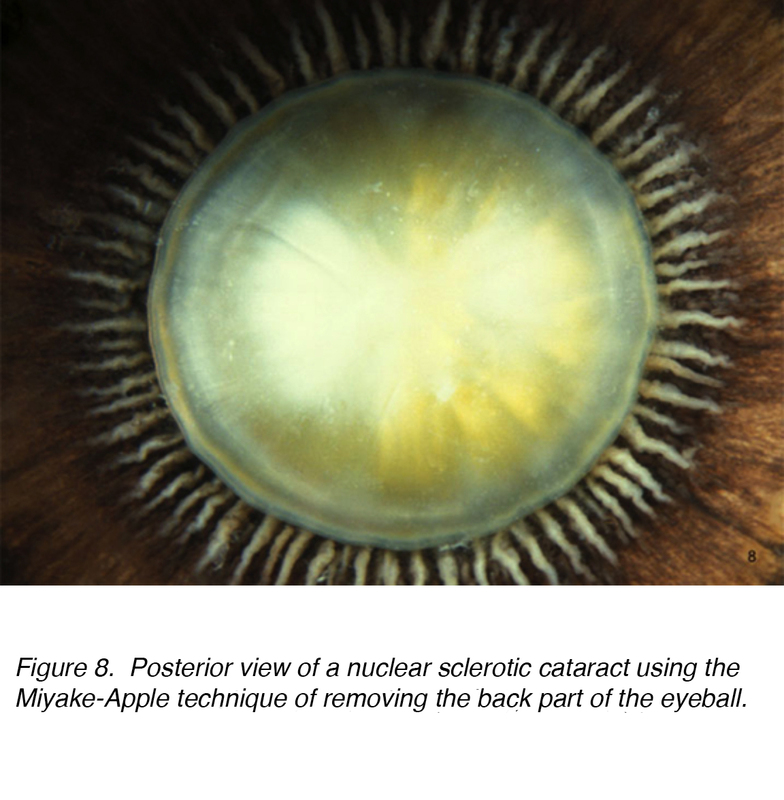 Posterior view of a nuclear sclerotic cataract using the Miyake-Apple technique of removing the back part of the eyeball. With age, nuclear fibers become more compacted and cause increased light scattering. As a result, sclerotic lens nuclei decrease in transparency and result in visual aberrations and annoying glare at night. Clinically, the sclerotic nuclear lens changes in color, from a clear transparent material to yellow or orange, eventually even to brown (brunescent) if left to mature (Fig. 9). Histologically, nuclear sclerotic lenses are characterized by a dense homogenous material. Figure 9. Isolated brunescent cataract. 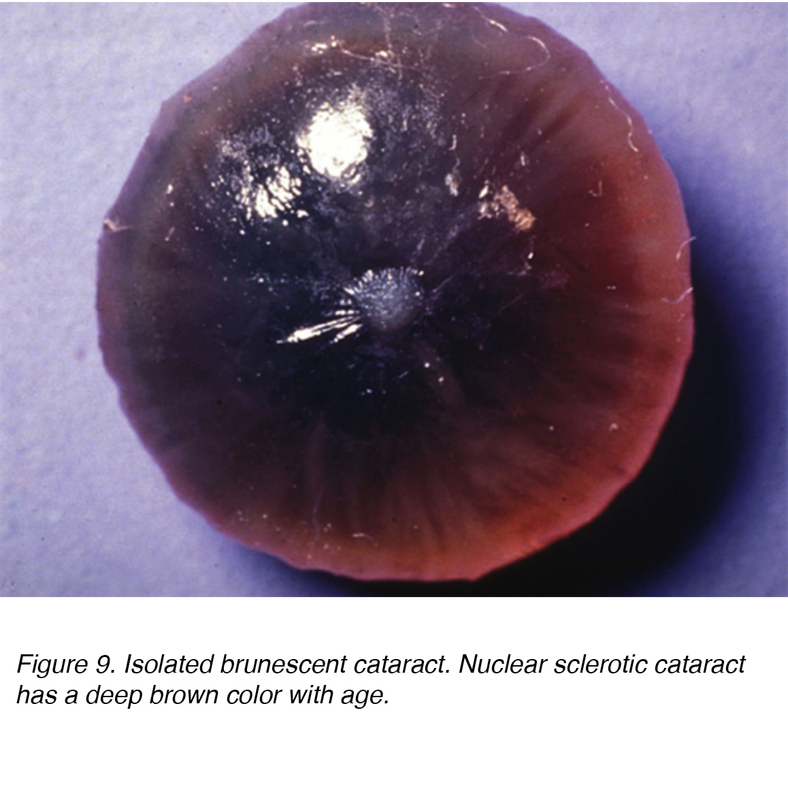 Nuclear sclerotic cataract has a deep brown color with age. As the cataract continues to mature, the cortical material begins to liquefy and the nucleus increases in opacity. A hyper-mature cataract is the final stage of the aging process. The liquefied cortex is resorbed, and the dense nucleus sinks within the capsular bag. If left untreated, proteinaceous material can leak across the capsular lining and cause trabecular meshwork (TM) obstruction leading to a phacolytic glaucomatous reaction. This inflammatory reaction is mediated by macrophages that response to the leakage of lenticular protein and contribute to the TM obtruction. Changes within the lens nucleus do not occur independent of the other lenticular structure, instead, cortical subcapsular cataracts may and typically occur simultaneously. However, nuclear sclerotic cataract is by far the most common age-related lenticular opacity. Figure 10 shows a photograph of a patient’s eye with dense mature cataract that has both nuclear and cortical (see below) components. Obviously the patient was “blind” in this eye, and this cataract needed to be removed to restore sight to the eye. Figure 10. Photograph of a patient’s right eye with a dense mature cataract. Courtesy of James Gilmore, Photography department at the Moran Eye Center. As in nuclear sclerotic lens changes, aging can cause similar degenerative changes in the lens cortex. The opacities formed within the lens cortex are quite unique. Sharp clear fluid clefts resemble opaque spokes within the lens cortex, are seen (Figs. 11,12). Figures 11 and 12 show the typical appearance of cortical cateract shown from the front (Fig. 11) and the back (Fig. 12). Figure 11. Clinical photograph of a cortical cataract with prominent cortical fluid clefts (black lines). Figure 12. 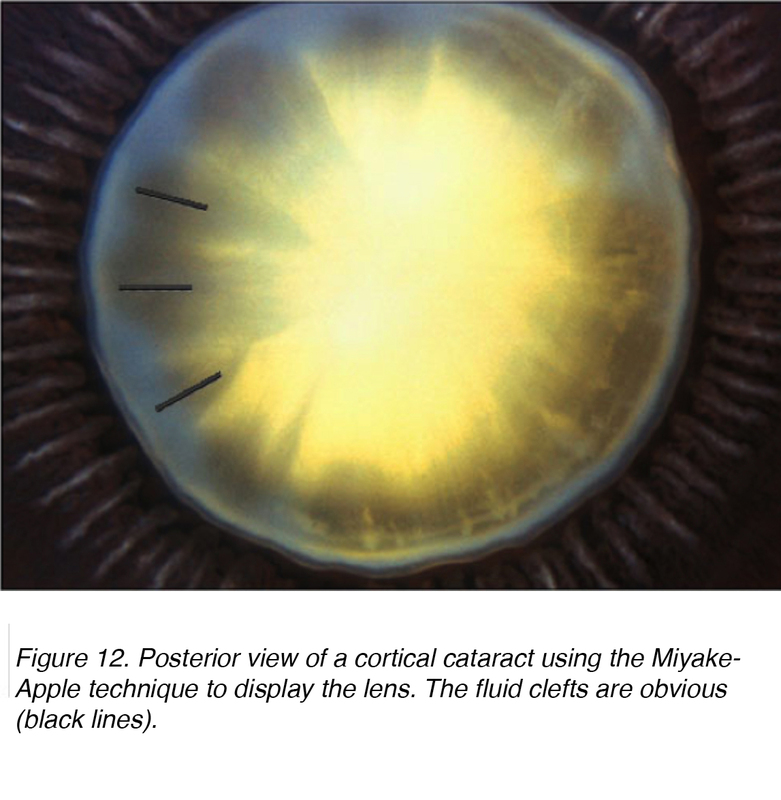 Posterior view of a cortical cataract using the Miyake-Apple technique to display the lens. The fluid clefts are obvious (black lines). 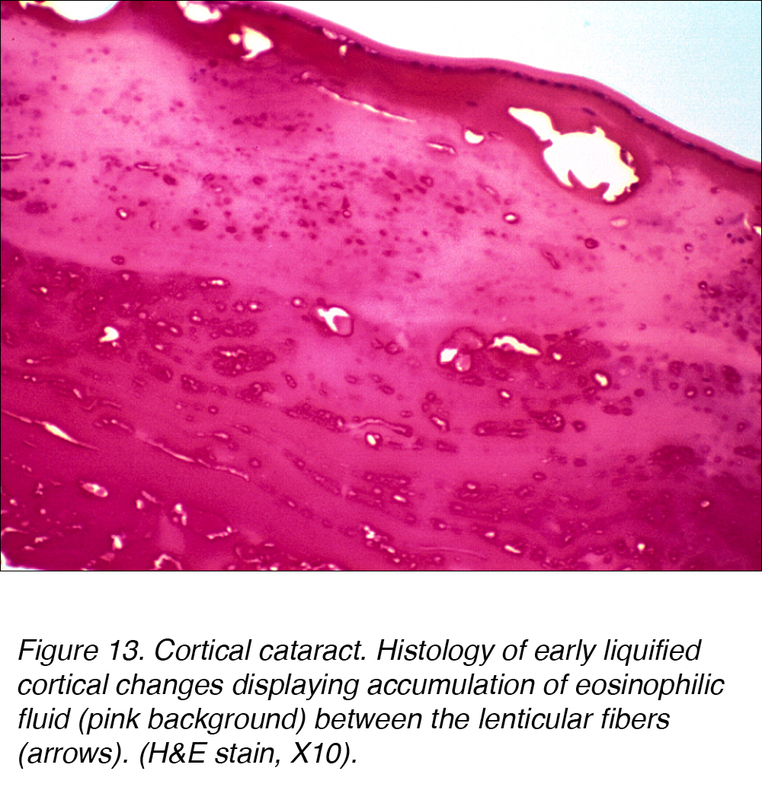 Histologically, cortical cataracts are characterized by an accumulation of pink staining eosinophilic fluid between cortical fibers (Fig. 13). Figure 13. Cortical cataract. Histology of early liquified cortical changes displaying accumulation of eosinophilic fluid (pink background) between the lenticular fibers (arrows). (H&E stain, X10). This fluid accumulation causes shifts between lenticular cells leading to displacement and degeneration of bordering cells. The shift accounts for the spokes seen clinically (Figs 11 and 12). Globules of proteinaceous material, called Morgagnian globules, may be released from the degeneration of the cortical lens cells (Fig. 14). As the cortical cataract continues to mature, the entire cortical region can be replaced by these globules and thus becomes a mature Morgagnian cataract (Fig. 15). Figure 14. 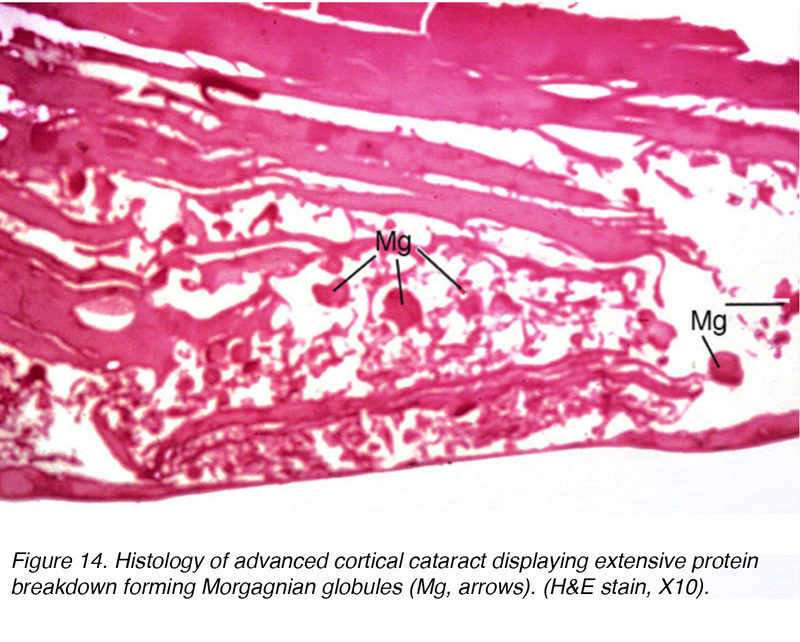 Histology of advanced cortical cataract displaying extensive protein breakdown forming Morgagnian globules (Mg, arrows). (H&E stain, X10). Figure 15. Morgagnian cataract. 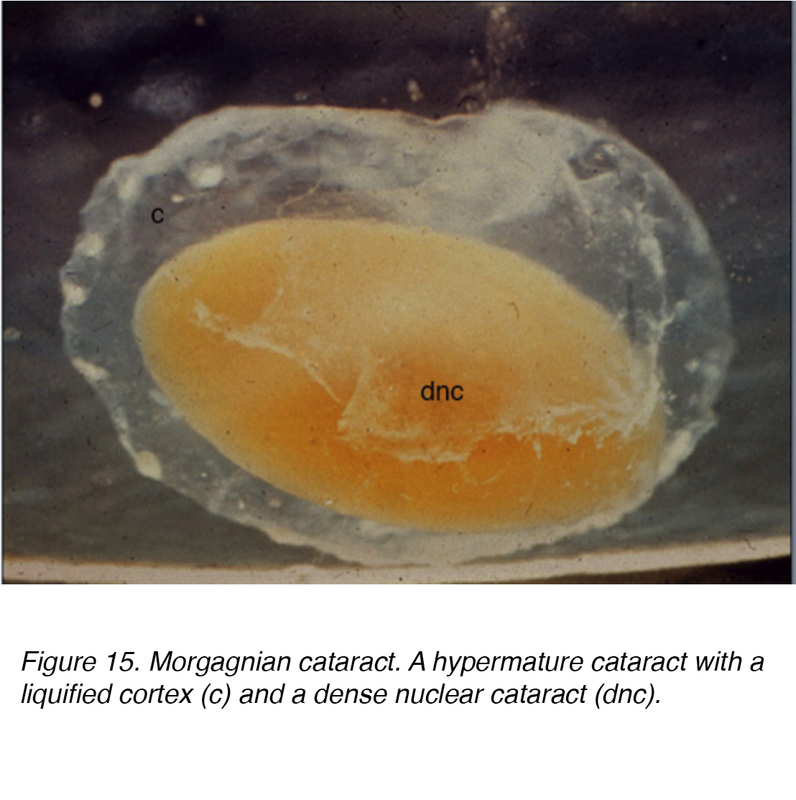 A hypermature cataract with a liquified cortex (c) and a dense nuclear cataract (dnc). Another characteristic appearance of the cortical cataract is a Christmas tree cataract. This occurs when crystals form within the deep cortex. These crystals are typically composed of cholesterol, lipids, calcium or other compounds. Interestingly, Christmas tree cataracts do not typically cause significant visual impairment. While a cortical cataract can occur independently of a nuclear sclerotic cataract, biomechanical changes within the lens nucleus can actually induce cataractous changes in the lens cortex. The ability to effectively accommodate decreases with age, in general. The altered biomechanics between the sclerotic nucleus and cortex creates residual sheer stress and results in parallel micro-ridges at the area of lamellar separation. This process helps to explain the histologic patterns seen in cortical cataracts. Posterior subcapsular cataracts (PSC) develop due to the posterior migration of lens epithelial cells in response to external stimulus. Although most cases are spontaneous, PSC also can develop secondarily to metabolic causes, such as diabetes, inflammation, uveitis, or from long-term topical or systemic corticosteroid use. PSC tend to occur in younger patients and progress more quickly than the other cataract subtypes. The opacity is located at the posterior pole of the lens on the anterior surface of the posterior capsule (Figure 16 and 17). Figure 16. 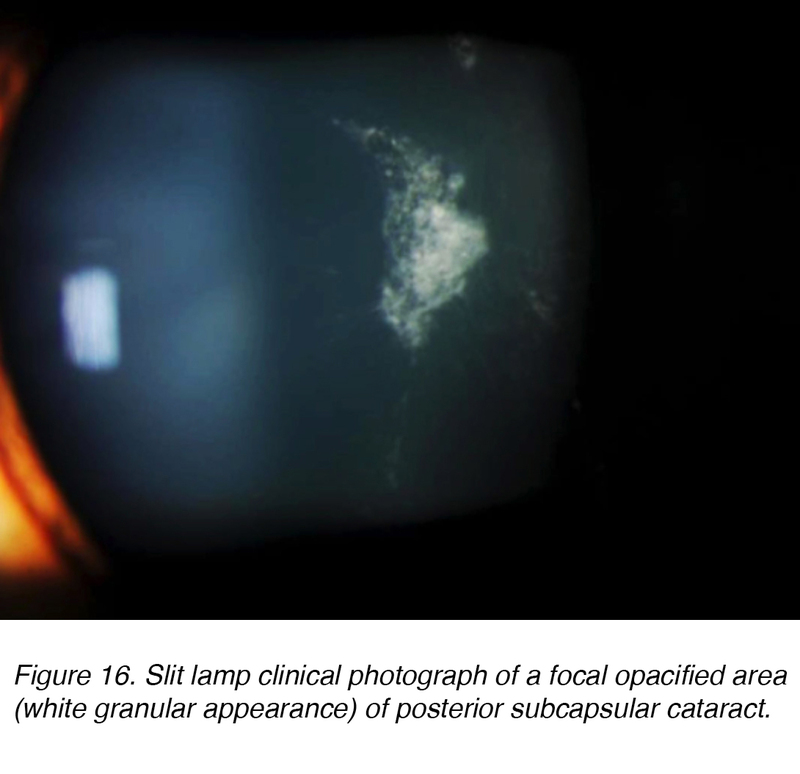 Slit lamp clinical photograph of a focal opacified area (white granular appearance) of posterior subcapsular cataract. Figure 17. 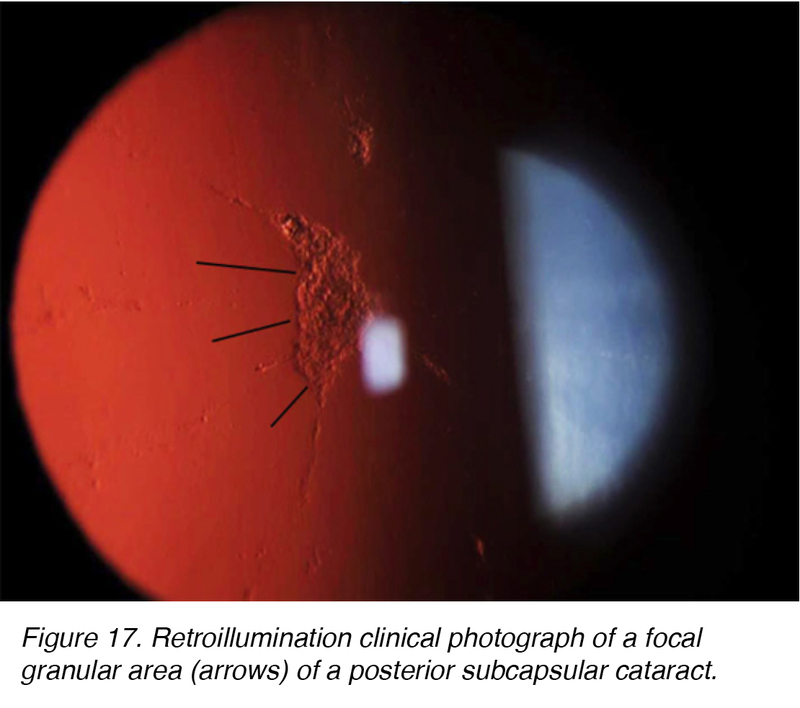 Retroillumination clinical photograph of a focal granular area (arrows) of a posterior subcapsular cataract. Figure 18. 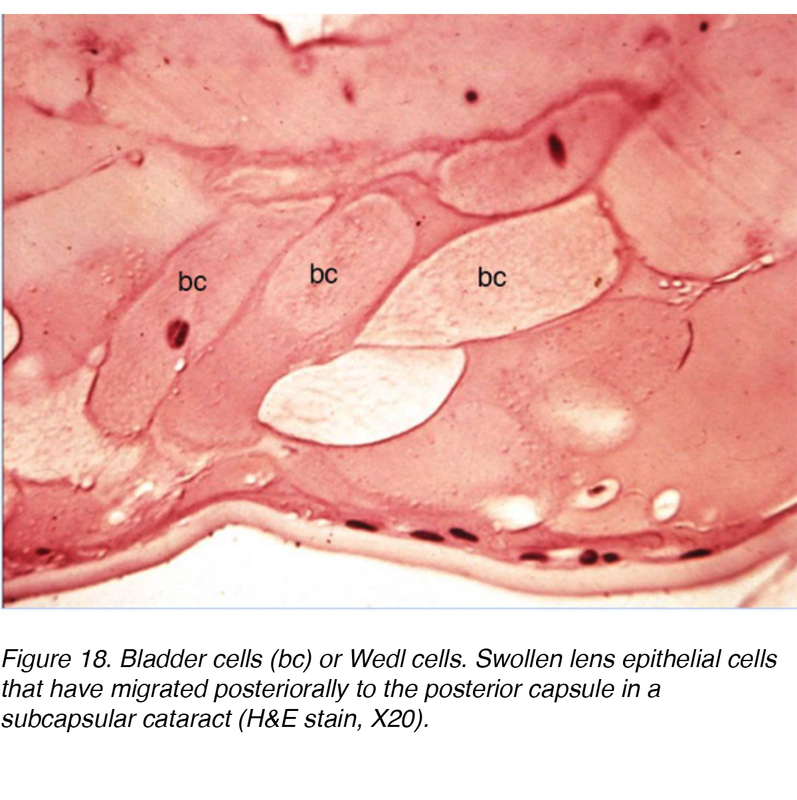 Bladder cells (bc) or Wedl cells. Swollen lens epithelial cells that have migrated posteriorally to the posterior capsule in a subcapsular cataract (H&E stain, X20). Anterior subcapsular cataracts (ASC) develop because of the degeneration of anterior lens epithelial cells. They can develop secondary to trauma, medical treatment iatrogenic causes, or spontaneously. The area of damage causes a migration of lens epithelial cells into the area and subsequent transformation of the cells into myofibroblasts in a process known as fibrous metaplasia. This results in an opacity on the anterior surface of the lens beneath the anterior capsule. Figure 19. 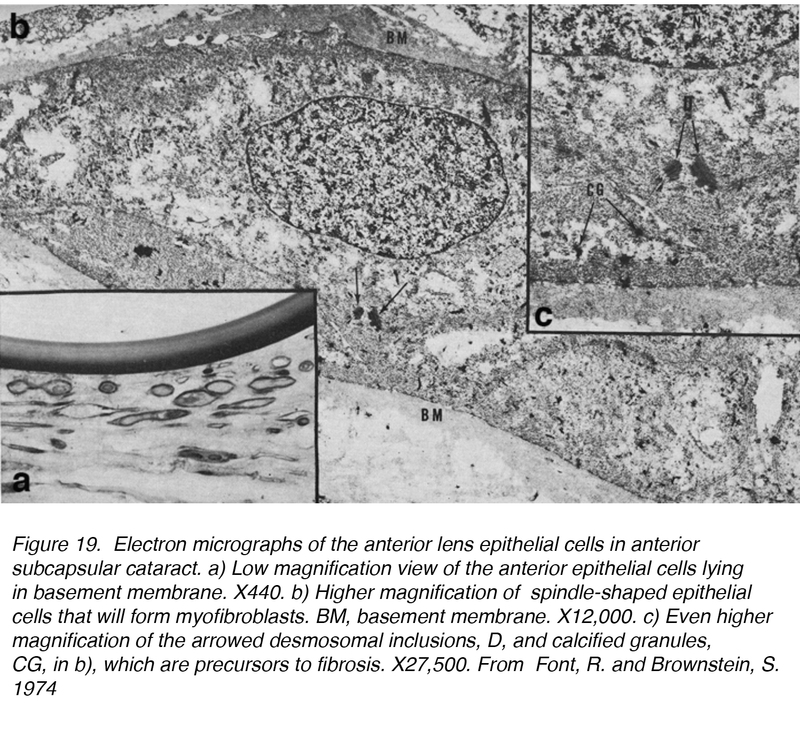 Electron micrographs of the anterior lens epithelial cells in anterior subcapsular cataract. a) Low magnification view of the anterior epithelial cells lying in basement membrane. X440. b) Higher magnification of spindle-shaped epithelial cells that will form myofibroblasts. BM, basement membrane. X12,000. c) Even higher magnification of the arrowed desmosomal inclusions, D, and calcified granules, CG, in b), which are precursors to fibrosis. X27,500. From Font, R. and Brownstein, S. 1974. Direct injury to the head or eye can cause significant mechanical disruption and lead to cataract formation. A Vossius ring can occur if the insult caused the posterior iris pigment epithelium to imprint on the lens capsule. The pigment deposition may abate and resolve completely with time. Severe blunt injury can cause stellate lenticular opacities in the cortex and capsule. Such insult can lead to lens epithelium dysfunction, resulting in a significant edematous response to the superficial cortical lens. Vacuole pockets can then become trapped permanently within the lamellar zone, becoming integrated within the lenticular fibers while new layer are elaborated over the lesion. Alternatively, blunt trauma can also cause cataract formation within all the lenticular layers, leading to a diffuse fibrous metaplasia (Fig. 20). Other forms of trauma that can lead to cataract formation include exposure to radiation, infrared, extreme heat and electrical injury. Figure 20. Traumatic cataract. 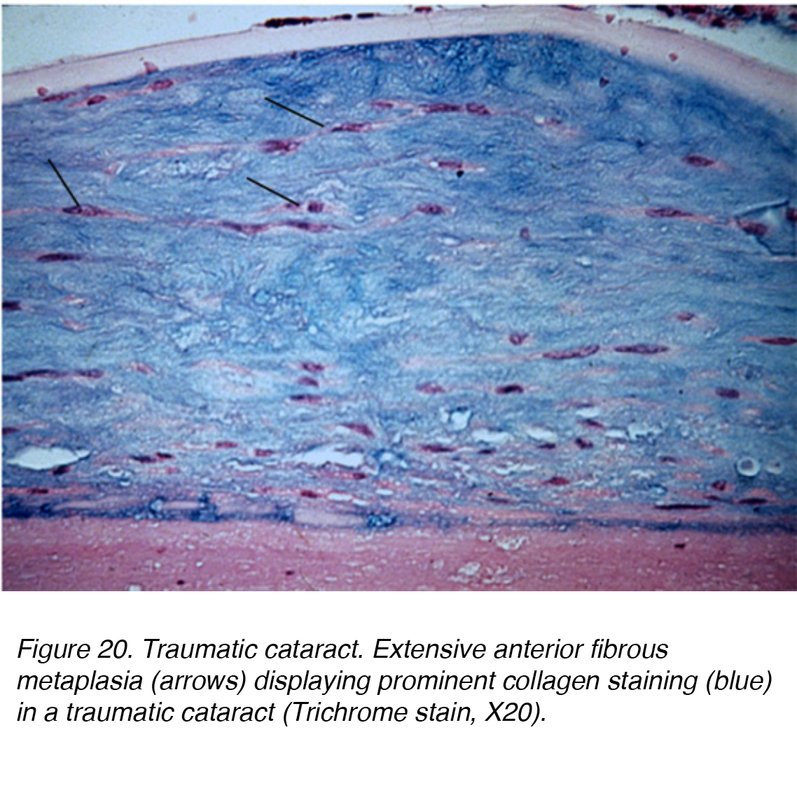 Extensive anterior fibrous metaplasia (arrows) displaying prominent collagen staining (blue) in a traumatic cataract (Trichrome stain, X20). Several pharmacological agents have been shown to cause cataract formation. Long term corticosteroid therapy and anabolic steroid use are among the most common agents associated with cataract formation, particularly posterior subcapsular cataract. The incidence and severity of PSC is directly related to the dose and duration of use. Interestingly, steroid therapy has become a frequent treatment option in the management of retinal pathologies, and in turns increases the rates of cataract formation. There does not appear to be any distinction between PSC induced by steroid use or a pure age-related PSC. Phenothiazine is another therapeutic agent that can cause lenticular opacities. Psychotropic agents, particularly phenothiazine, induce deposition of pigmented material into the anterior lens epithelium in a very distinct axial configuration . Other pharmaceutical agents known to cause lenticular cataracts include miotics, and amiodarone . While age-related changes remains the leading factor for cataract formation, specifically senile cataract, other contributory factors include smoking, systemic disease, excessive exposure to sunlight and the aforementioned pharmacological agents [16-19]. Many systemic diseases can cause cataracts, such as, diabetes mellitus, hypocalcemia, myotonic dystrophy and Wilson’s disease [19-21]. In diabetic patients, cortical and PSCs appear to occur earlier, particularly among patients with poor glycemic control. 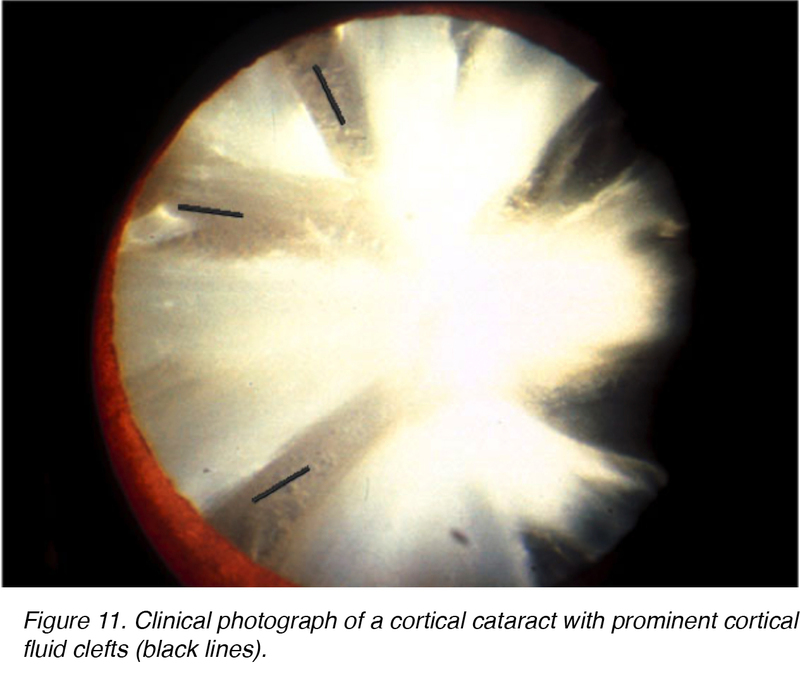 Hypocalcemia-induced cataracts usually initiate as small white dot opacities that can coalesce into larger flakes. Smoking, sun exposure and systemic disease management are modifiable risk factors, so taking measures to changes these factors can delay the onset and progression of cataract formation. Phytonutrients, such as xanthophyll carotenoids, lutein and zeaxanthin may play a potential role in limiting or neutralizing light induced oxidative changes within the lens . Currently, there are several ongoing studies evaluating other possible protective agents. Although there is no definitive measure to prevent cataract formation, cataract surgery remains an extremely safe and highly successful intervention. Two videos showing cataract surgical procedures from the anterior and posterior views of the anterior segment of the human eye. From the anterior view (mp4 file). From the posterior view (mp4 file). 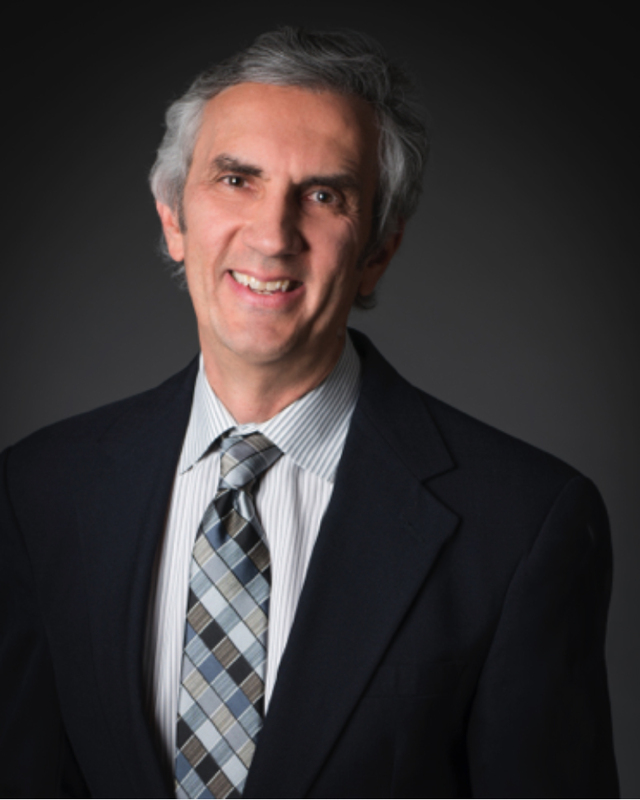 Surgery for cataracts has undergone extensive evolution. Ancient knowledge viewed the cataratous eye as an imbalance of humors that needed displacement to recover vision. Using a needle, the surgeon would proceed to displace the abnormal humor until the crystalline lens dislocated. Modern cataract surgery has undergone significant changes and is now characterized by several steps: corneal incision, continuous curvilinear capsulorrhexis (CCC), hydrodissection, phacoemulsification, cortical aspiration, and intraocular lens (IOL) implantation. Details of the types of intraocular lenses, that are presently being used in cataract surgery, are presented in the following chapter in webvision by Jason Nguyen, and Liliana Werner. Mcgraw, B.F. and Rollins, C.L. 1979. 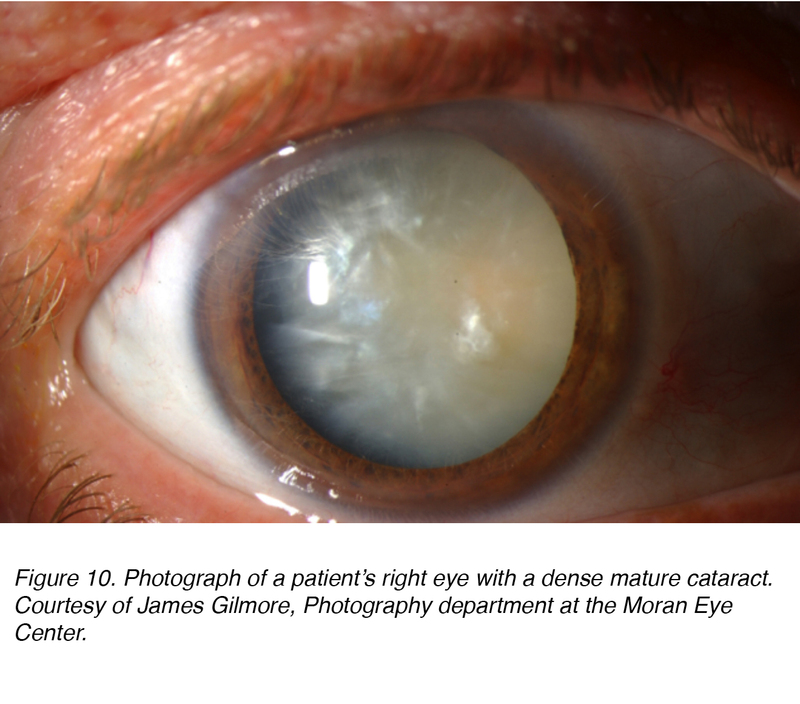 Topical-Corticosteroid-Induced Cataracts. Annals of Pharmacotherapy. 13, 9 (Jan. 1979), 537–538. Gimbel, H.V. and Neuhann, T. 1991. Continuous Curvilinear Capsulorhexis. Journal of Cataract & Refractive Surgery. 17, 1 (1991), 110–111.